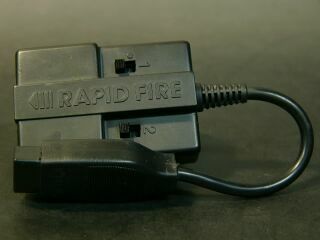 The Rapid Fire Unit (ラピッドファイアユニット) , known simply as the Rapid Fire in Brazil, is an accessory designed for use with the Sega Master System. It is a small device that is inserted between a two-button controller and the console, providing an auto-repeat capability for the control buttons. This saves a lot of wear-and-tear on fingers for games like Astro Warrior and limits the need for a user to buy brand new controllers with built-in turbo features. The auto-repeat can be turned on for each button independently. In North America this unit was offered by Sega via their early "Team Sega" newsletters. Buying three games would get you a rapid fire unit, though it was also available to purchase separately in stores. It was also packaged with the Control Stick under the name "Rapid Fire Control Stick". Main article: Rapid Fire Unit/Magazine articles.